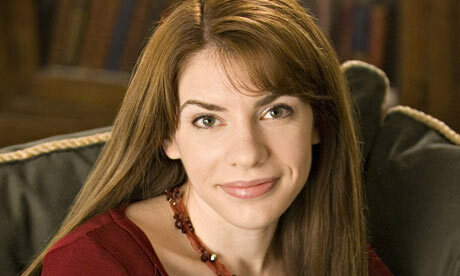 Stephenie Meyer is an Author and Producer, best known for her vampire romance series Twilight. 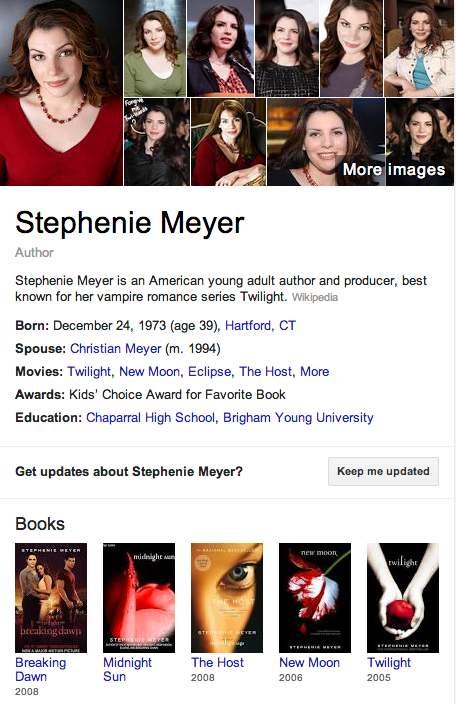 Stephenie Meyer’s life changed dramatically on June 2, 2003. The stay-at-home mother of three young sons woke up from a dream featuring seemingly real characters that she could not get out of her head. Meyer invented the plot during the day through swim lessons and potty training, and wrote it out late at night when the house was quiet. Three months later she finished her first novel, Twilight. With encouragement from her older sister (the only other person who knew she had written a book), Meyer submitted her manuscript to various literary agencies. Twilight was picked out of a slush pile at Writer’s House and eventually made its way to the publishing company Little, Brown where everyone fell immediately in love with the gripping, star-crossed lovers. Twilight was one of 2005’s most talked about novels and within weeks of its release the book debuted at #5 on The New York Times bestseller list. Among its many accolades, Twilight was named an “ALA Top Ten Books for Young Adults,” an Amazon.com “Best Book of the Decade…So Far”, and a Publishers Weekly Best Book of the Year. The highly-anticipated sequel, New Moon, was released in September 2006, and spent more than 25 weeks at the #1 position on The New York Times bestseller list. In 2007, Eclipse literally landed around the world and fans made the Twilight Saga a worldwide phenomenon! With midnight parties and vampire-themed proms the enthusiasm for the series continued to grow. On May 6, 2008, Little, Brown and Company released The Host, Meyer’s highly-anticipated novel for adults which debuted at #1 on The New York Times and Wall Street Journal bestseller lists. The Host still remains a staple on the bestseller lists more than a year after its debut. On August 2, 2008, the final book in the Twilight Saga, Breaking Dawn was released at 12:01 midnight. Stephenie made another appearance on “Good Morning America” and was featured in many national media outlets, including Entertainment Weekly, Newsweek, People Magazine and Variety. Stephenie headlined the Breaking Dawn Concert Series with Justin Furstenfeld (lead singer of Blue October) to celebrate the release in four major markets across the US. Breaking Dawn sold 1.3 million copies in its first 24 hours. The Twilight movie, directed by Catherine Hardwicke and starring Robert Pattinson and Kristen Stewart, was released on November 21, 2008. Twilight debuted at #1 at the box office with $70 million, making it the highest grossing opening weekend for a female director. Stephenie lives in Arizona with her husband and three sons. Here is a list of interviews with Stephenie Meyer, and links to the text, audio, or video. Stephenie Meyer graduated from Brigham Young University with a bachelor’s degree in English. She lives with her husband and three young sons in Phoenix, Arizona. 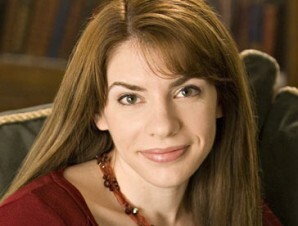 After the publication of her first novel, Twilight, booksellers chose Stephenie Meyer as one of the “most promising new authors of 2005” (Publishers Weekly). For a list of interviews with Stephenie Meyer, and links to the text or audio, click here.